JBass is a four strings american Fender Custom shop Jazz bass with flatwound strings. The first Jazz Bass was made in 1960. It was made to accompany Fender's new guitar at the time, the Jazzmaster. The neck on the Jazz Bass were longer and narrower than any of Fender's previous models. This new design was intended to mimic the feel of the stand-up bass. Even the new mid tones that the guitars could produce were made with jazz musicians in mind. The sound of the Fender Jazz Bass has been fundamental in the development of signature sounds in certain musical genres, such as funk, disco, reggae, blues, heavy metal and jazz fusion and is now used in almost any genre. Play mode: you can choose the playing technique, we recorded the bass using the fingers, a pick, playing it with the fingers or the pick with the palm muting the strings. Compression: you can turn the multiband combressor on or off. 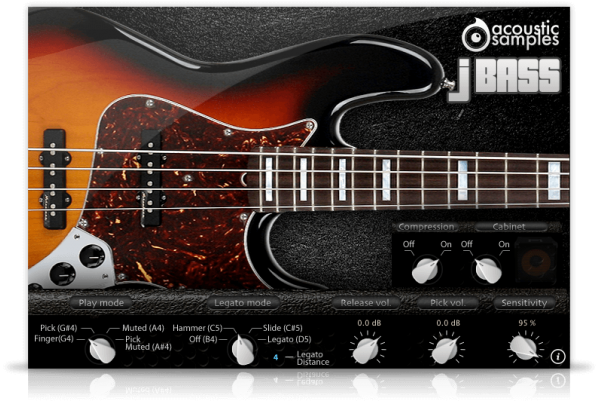 JBass comes with its own sample player, the UVI Workstation 3 (requires v3.0.0 or later). 1.72Gb uncompressed, 750Mb compressed in lossless flac format, around 2500 samples. 6 Velocity layers for the sustain (two round robins, so 12 samples per note). 15 Velocities for the release. Pick, muted and mick muted samples. This is really the best electric bass I've heard and used so far, with my previous favorite being the Kurzweil basses. This one maybe doesn't have all the articulations I'd look for in my "go to" instrument but, the sounds are there. The Scarbee basses sound EQ'd to be more mix-ready maybe, but to my ears they sound a bit thin. The "instrument" part of the J-Bass software is easier for me to get my head around, whereas Scarbee seemed capable but less intuitive for me. The con here is that it takes a while to load this instrument and you may end up EQ'ing it to sound like Scarbee after all. The sound of J-Bass can just be described as great. I fell in love with this one from the first note I heard from the demos. Actually as being a bassist myself this library leaves me with some mixed feelings because it gives the premonition that in a not to distant future we will be needed less and less in the studios ;( There is even the choice between playing with pick or fingers with or without palm mute and all of these techniques just sound great! This is indeed the best bass virtual instrument I know and actually sounds better than lots of "real bass recordings" I heard and everything for a price which isn´t even comparable to a good bass. The hammer-ons and slides also sound nice and with good programming you really can give a lot of life to a bassline. The only thing that I think which could have suited this library would be some more velocity layers, especially within the low velocities for some softer articulations. Nevertheless, great job on this one! After listening to "another one bites the dust" I immediately knew that I would get this Fender Jazz Bass sound. It`s simply the best Fender Jazz Bass sound I ever heard. And I heard i.e. Thomas Skarbyes J-Bass that is a very similar sounding bass sound. Thank you acousticsamples for making these great sounds ! I appreciate.